This world is not always friendly. We are always in a trauma of losing or getting hurt. Even within the four walls of our home is not safe for us. Bad luck dwells with us always. Most of the accidents happen in the bathroom and kitchen. Elderly persons and the kids are victims of such accidents and the prime reason is falling. The age from 60 to older and less than 5 are frequently becoming victimized in incidents occurring at home especially in the bathroom. A British research said that more than 18,000 older Americans die every year only because of a fall, and the rate is rising gradually. Under this circumstances, a grab bar can be a facilitator for us. It can be an easy and reliable helper to make the bathrooms a little bit safer place for the victims. So we all should know how to install a shower grab bar by ourselves. The suction cup bar installation. Both the ways are easy and straightforward. But a little carelessness in installation can result in a serious damage. The improper way may cause dangerous issues. As safety and comfort are our primary wants we should ensure the proper and secure installation. We should choose the best shower grab bar for our assistant in the bathroom. To choose the best one we can get advice from Google. A good quality grab bar can hold up to 500 pounds at a time. First, unseal the box or packet and examine everything to ensure that all are in perfect condition or not. Check carefully the screws and anchors whether they fit their determined places; if not, you will have to buy a new one again. Located on the wall to screw the grab bar too. Normally 16” (40.6 cm) apart, measured from center to center. Located after knocking on the wall whether there is room on the other side of the wall. Otherwise, you will have to use a stud sensor. After finding the studs’ position, mark with a pencil through the screw hole points of the bar. Then place the masking tape over the mark. The bottom of the bar should be 6-10” above the top of the tub. Now mark on the masking tape carefully in the right position of the studs. Attaching the masking tape prevents the drill bit from skating across the tile and scraping it up. It also saves the tile from cracking. Now choose the drilling bit which will adjust the wall screw perfectly. Use a 1/4-in” glass-and-tile or masonry bit to enlarge the holes through the tile, but use a 5/32” bit to drill into the wood. Finally, put the grab bar on the determined position and slide the screws through the mounting holes of the bar and tighten it gradually. Fix the mounting cover to conceal the screws. Now seal the age of the mounting place where it meets the wall with the silicone caulk for the shower to prevent water flow into the hole. It also tightens the attachment. The last job is to test by holding and pulling it before use. Technology has lessened the human labor. The latest trend in grab bars are the suction grab bars. It can be installed without using any tool. No drilling is necessary here. It is removable anytime and anywhere. Green = The bar is successfully installed and ready to use. From the above description, it is clear that grab bar installation is not a hard task. Mere common sense can make everything easy. 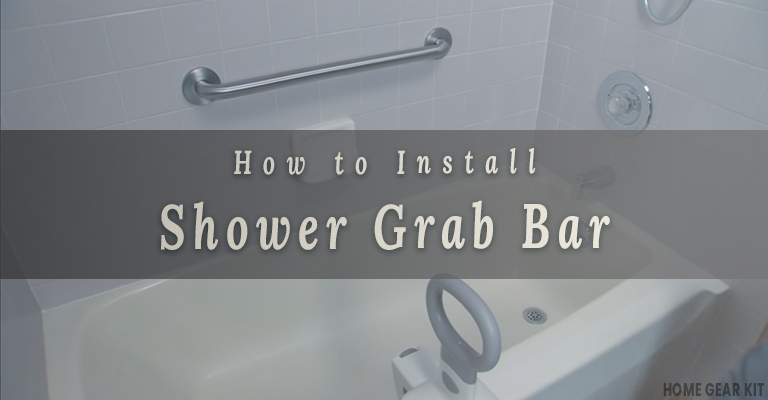 We all should know how to install a grab bar and make it know others. Check the bar before each use whether it has been installed successfully or not. If necessary should be reinstalled.